This renovated two bedroom, two bath villa is conveniently located on the second floor in sought after building one. 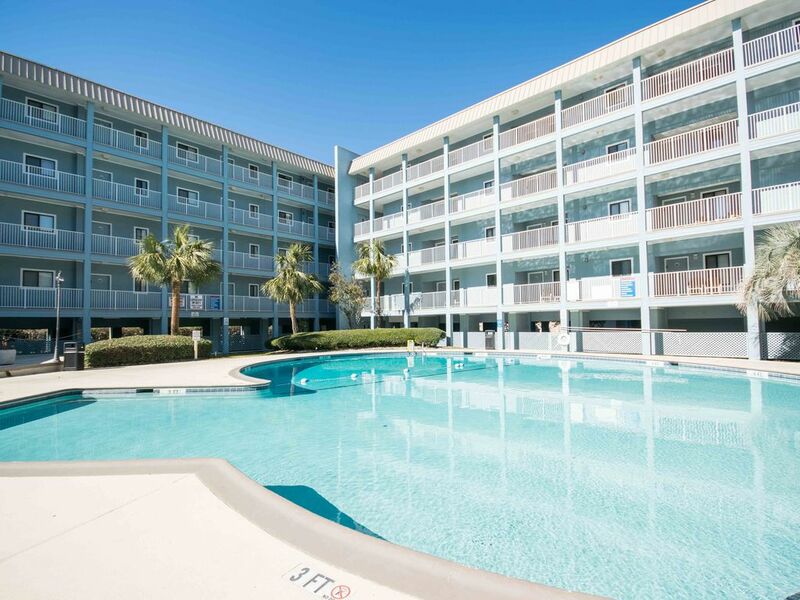 Convenient to parking and just steps away from the largest outdoor pool, deli/bar,/store, and private boardwalk to the beach. The villa was newly painted in 2018. Convenient to everything, this villa has free secure Wi-Fi and flat screen TVs in living area and bedrooms.The flat screen television in the living area is equipped with a blu ray DVD player with 64 cable channels. This unit has more than 850 sq. feet and will sleep four in beds plus a sleeper sofa making it sleep 6 comfortably. Large dining table seats six.The kitchen is fully-equipped with dishes, pots and pans, toaster, coffeemaker, microwave, dishwasher, and other kitchen necessities. Just bring the food! COCO's, our beach side cabana has everything you could want from food, drinks, shade, restrooms, ice, sunscreen, and beach volleyball! Don't feel like the 5-6 min. walk to the beach on the boardwalk? We have a free BEACH SHUTTLE! For Rainy days, there is an INDOOR HEATED POOL, JOGGING TRACK, HOT TUB, KIDDIE POOL and EXERCISE ROOM. And last but not least our beautiful beach! The private boardwalk crosses a scenic saltwater marsh and tidal creek abundant with wildlife, including herons and egrets. NO roads to cross to enjoy one of the last private beaches on the island. Our beach is almost never crowded! We provide the towels, linens, and starter paper products. WHY BRING ALL YOUR BEACH STUFF FROM HOME? Just bring your swimsuit and beach towels! We provide beach chairs, a beach umbrella, boogie boards and a beach buggy to roll all of your things to the beach. Located in a gated community next to the world famous Robert Trent Jones Oceanside golf club. Rent bikes on island from companies that will deliver/pick up at the resort (we provide contact info for bike rentals.) The whole island has beautiful scenic bike trails that can be enjoyed by the whole family. Hilton Head Island is consistently voted as one of the top vacation spots in the United States! Originally born in NY, we moved to South Carolina in 2006. We shortly visited Hilton Head Island & instantly fell in love with it. A few years ago, we decided to get a place so we had a permanent place to visit when ever we wanted to. Living three hours away from the beach was hard for us, seeing how in NY, the beach was only twenty minutes away. Now with our beach condo, we can quickly "escape" for a weekend at the beach. Smelling the salty air of the ocean just melts all your troubles away. We decided on Hilton Head Island because it is only a short drive to from our permanent address. The beaches are beautiful and being in Hilton Head Island gives you the feeling on being on a resort island without even leaving the USA! All the amenities that Hilton Head Resort offers you, you can't go wrong. The beach, 3 different pools, a work out room, sauna, hot tub, tennis courts. Located next the Robert Trent Jones Golf Course, minutes away from other world class golf course. Everything you can possibly want right outside the door. We have a blu ray dvd player in the living room. Directly next door to Robert Trent Jones golf course. We do not provide clubs or any discounts, but Hilton Head is known for the numerous world class golf course, all within minutes from location. Our villa is in Building 1 which has the biggest outdoor pool. In building 3 there is the indoor pool & Building 4 has a smaller outdoor pool. The condo was quite comfortable and efficient. We enjoyed some beautiful sunrises and sunsets, although the temperature was chilly. Our family enjoyed our first stay at the resort! My family enjoyed our stay at the resort. Our condo was clean and met our needs for a pleasant vacation. We used the kitchen on a daily basis with two small children and all the tools we needed were provided. The shuttle to the beach was wonderful and having three pools with one indoor pool worked out great with getting the kids out of the sun. Location was convenient to restaurants and shopping so close by. Thanks for everything! We went on girls trip to HHI! We love the resort and the amenities! This condo was very nice! It was loaded with everything you could need. The owner was very easy to communicate with and we appriciate! We can’t wait to do it again! Thanks for offering a great rental property! I am so glad you had a great time at my condo making great memories with your friends. It was a pleasure hosting you. We would love to have you back anytime. It was just like the pics.. I would stay at HH Resort again, but probably in another unit, unless this one gets some updates. When we arrived we found the condo to be cozy, but not as clean as I would like. I was going to ignore the dust bunnies & dirty floors, but emailed the owner when we found mold in the coffee maker. She was very responsive & had a new coffee maker dropped off on Monday. She was very apologetic about the cleanliness issue & the coffee maker & refunded my cleaning fee as well. The bathrooms & bedrooms were pretty clean besides the floors. If you eat out a lot, then this would be fine for most middle class families. If you plan to eat most meals in it might be a bit difficult. We usually only eat out 2-3 times while on vacation, so I spent a lot of time in the kitchen. It has a very odd layout, which makes it nearly impossible for 2 people to cook together, or for 1 person to get into the fridge while another is cooking. The kitchen is stocked with basic utensils & cookware, but there is a crock pot, which was wonderful. The owner also had beach items & a beach wagon available, which saved us space in the car. The wagon was critical when loading up the family to go to the beach, as there is quite a walk down the boardwalk. If you can't handle the walk the shuttle came by often. My recommendation for the owner is to do a deep clean of the kitchen including the cabinets. I would paint the cabinets white or off-white inside & out (possibly with Kilz inside if they are difficult to clean). They need new shelf liners also. I would make the storage closet more useful by adding a mop/ broom holder to the wall and some shelves for food storage, as the kitchen itself was lacking cabinet space for our groceries. Or add a small cabinet in the dining room area on the other side of the table & get rid of the stools as they were just taking up space. And lastly, I hope the cleaning staff is more diligent about doing the floors, especially getting under the beds & furniture. (When I swept there was cereal under my bed & swimsuit tags under the dresser along with lots of dust bunnies). I think this place could be much better with a little work, and great if the kitchen layout was tweaked. The owner was great to work with & I can see her making some changes to improve the place. The whole resort is very nice liked the fact of the boardwalk and beach being right there as well as the pool & island grill and deli. We will be back sometime next summer but make sure to stay longer next time. No pets allowed in the resort. No additional guests!